Santenay is the southernmost appellation in the Côte de Beaune, where the limestone ridge of the Côte d’Or begins to thin. Although wine from Santenay is sometimes considered rustic compared to more northerly appellations, earthy and brambly might be more appropriate descriptions. The best can be captivatingly aromatic, and priced far more reasonably than more recognized villages. 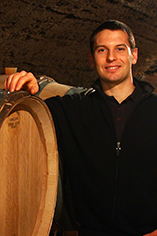 Young winemaker David Moreau seems to be harnessing every bit of his talent there to create wines of distinction. From the southern part of the village with its shallow, red ferrous soils, from vines planted in 1962, the 2011 Santenay 1er Cru Clos Rousseau exudes dark cherry aromatics before a sip brings a full-bodied and energetic texture. Matured in 1/3 new oak barrels this wine can be consumed early for its wild and primary fruit or developed in the cellar for over a decade. Read more about David’s Cuvee “S” here.